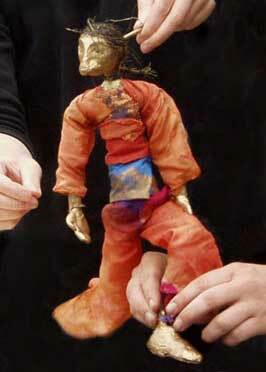 "Many Thanks for your participation in our Buxton Puppet Festival. The feed back from the audience response forms was very positive about your show. 80% thought it was 'GREAT', 20% 'FINE'. Other comments were 'brilliant, creative, captivating, funny, good storytelling, entertainment at its best'." you could smell the stories in the air. you could taste the stories on the tip of your tongue. you could feel the stories in the ripples of the water. Watch as this series of lyrical, comical tales unfold from a canvas map and transport us across the globe. This incredibly popular show can be performed virtually anywhere, appealing to the child in everyone and pleasing the imaginative.